Paddle through a diverse eco system as Native Americans did long ago. Manchac Swamp is a very appealing paddling destination due to its vastness, its limited accessibility and its variety of habitats and wildlife. Located northwest of New Orleans, the Manchac Wetlands is a true swamp -- a forest with a flat topography of ground that is either barely wet or barely dry. Located within this wet forest are waterways – either bayous or smaller and shallower sloughs. Stands of bald cypress border these natural waterways and ponds. Marshes also exist of freshwater grasses and scrubs. However most of the Manchac wetlands are water adapted hardwood trees and shrubs. Cutting through all the habitats are century old canals dug for timber or oil operations. These canals are intrusions on the natural landscape but they plus the natural waterways and ponds provide access for paddlers to the Manchac Wetlands. Fortunately for the paddler, there is on the east side access to the wetlands off of an unnumbered blacktop highway. From a very modest site, a paddler can paddle on an ancient bayou, old lumber canals, mile long slender “finger” lakes, trapper dug ditches and natural sloughs. All of these channels provide a web of waterways that can be used to access the forested swamp and the hundreds of acres of mixed and pure stands of bald cypress, water tupelo and freshwater marshes. In the spring, the wetlands green up. The cypress put out their bright green needles, forest floor plants spring up and in the marsh the winter gray/brown grass turns green and begins its annual growth. Within a month, the swamp seems to brighten with each tree and shrub contributing to a new spring time look. By late summer, the forests start to transition to the fall with tupelo leaves falling and a few cypress needles turning brown. By late fall the tupelos are bare and the cypress trees are mostly orange and brown. By Christmas the wetlands are shorn of green. However the bareness of winter will last only for only about eight weeks until March when the cycle of green begins anew. 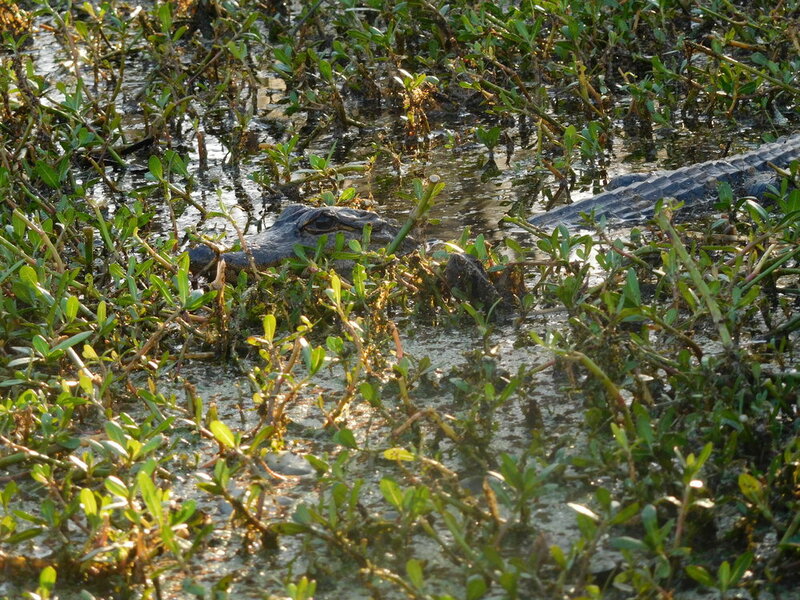 Wildlife in Manchac is represented by wading birds and by alligators although in the daytime the latter are usually out of sight. However at night on a warm evening, the gator’s eyes glow red in a spotlight swept across the waters. During the warmer months, the frogs and their sounds provide a nighttime chorus. Barred owls hoot at each other and at paddlers. Often after sunset, twilight paddlers hear sounds that can not be identified.